As some of you may have or may not have heard, Diablo 3 has finally received an official release date after years of speculation and deliberation - due on the 15th of May. Naturally, the western side of our world have gotten their pre-order details ready, but what about us in South East Asia? Well Asiasoft, Blizzard's official distributor in this region (through http://d3.playpark.net/), has recently confirmed that pre-orders will be done through them. 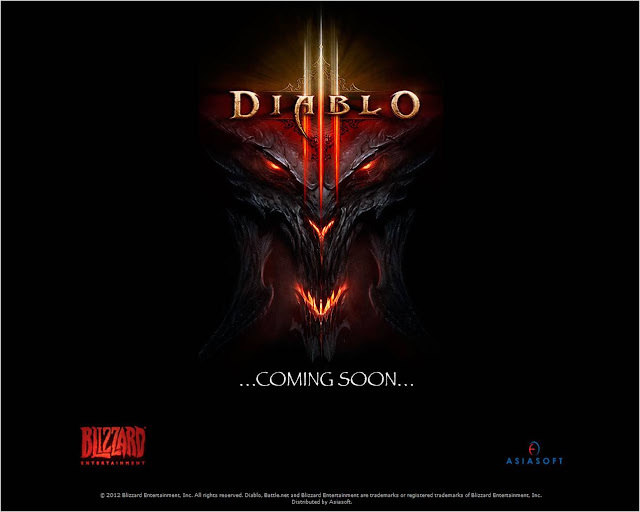 Though their official site is presently showing "Coming Soon", without any specifications on the price or whatsoever, Diablo 3 will be priced at RM218. Also, do note that nothing has been said about Diablo 3's collector's edition yet but here's hoping that it would be available in this region too, should we? http://d3.playpark.net/ now shows you a list of Malaysian, and Singaporean outlets which are pre-order-ready. Asiasoft will be holding a special launch event for Diablo 3 in Singapore, Funan IT Mall. (More details about the launch here).Copies of the game will be priced at SGD$89 in Singapore and RM218 in Malaysia.